Shops and streets across the country are, quite literally, painted red. Flowers and trinkets with sugary messages written on heart-adorned cards, boxes of sweet chocolates, bouquets of red roses, and cuddly teddy bears can only mean one thing: Valentine’s Day is drawing near. 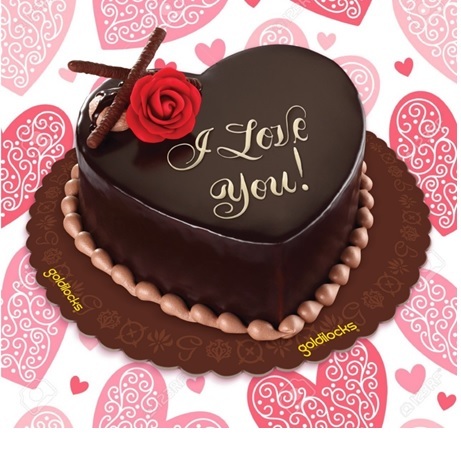 For this special occasion that celebrates love, romantic or otherwise, Goldilocks, the country’s number one bakeshop, has something that you can give to those whom you truly care about. Introducing Goldilocks’ Heart-Shaped All About Chocolate Cake—a moist and fudgy chocolate cake with chocolate mousse filling and whipped cream, topped with a red chocolate flower and chocolate sticks. For only PhP560 pesos, you can express your sweet love to the people you’re fond of. Aside from the limited edition cake, Goldilocks also has the classics such as Greeting Cakes, Choco lollipops, and Polvoron available for those who want to give more love to the object of their affection. For more information, log on to www.goldilocks.com.ph, or join the conversation by following Goldilocks on Twitter, Instagram, or Facebook at @GoldilocksPH.